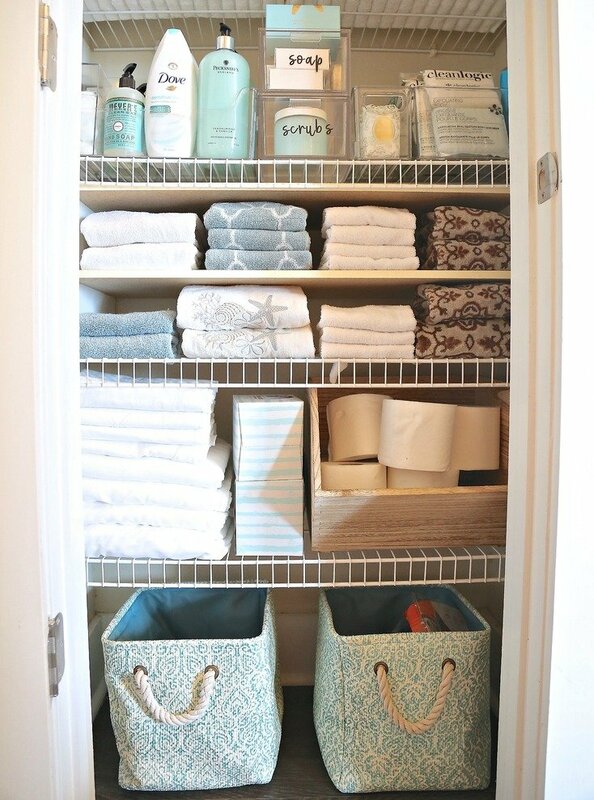 A few years ago, I organized my linen closet at our home at the beach and shared it on the blog. I recently had to reorganize it again due to some major construction, which pretty much turned our beach home completely upside down. As I put everything back after the construction drama, I used it as an opportunity to reorganize and do more linen closet organizing to create even more storage with a few tricks that I wanted to share with you guys. So here’s our linen closet before I reorganized it last weekend. Yep, as you can see, the closet was already full. How could I create even more storage space and pack more stuff in there? Because we have big groups that come to our place at the beach, I need to keep a lot of extra supplies on hand and I also need it all together and accessible for our guests. So let me show you what it looks like now after I reorganized it and I’ll explain what I did to create even more storage. Not that it really seems like a major difference, it actually is because I was able to really double up on storage if you look a little closer. 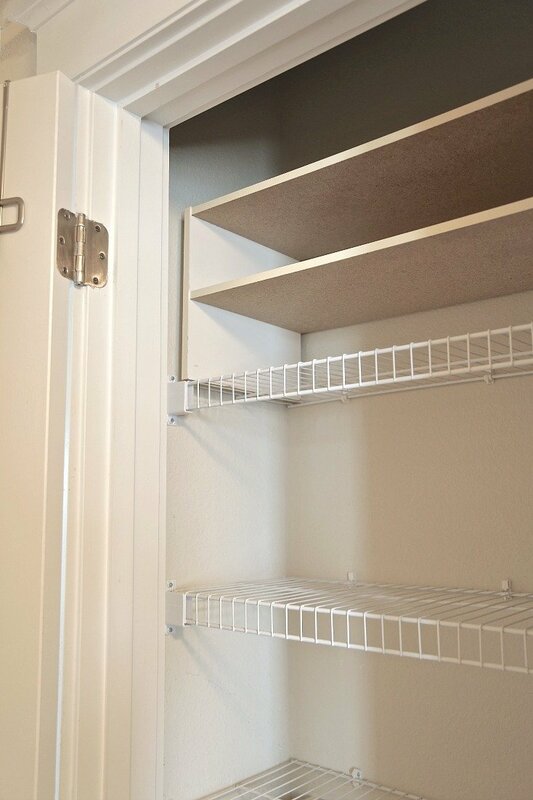 The way I was able to do it was with sliding in these ClosetMade shoe storage shelves (Amazon Affiliate Link) on the wire shelving to instantly create additional shelving to make better use of the wasted space. I already had one shoe shelving storage piece at the very top. The shoe shelving also helps to keep items separated, which is nice when you only need to pull one thing out. Look at all that wasted space I have at the top of my closet and how the shoe shelving really helps to maximize. 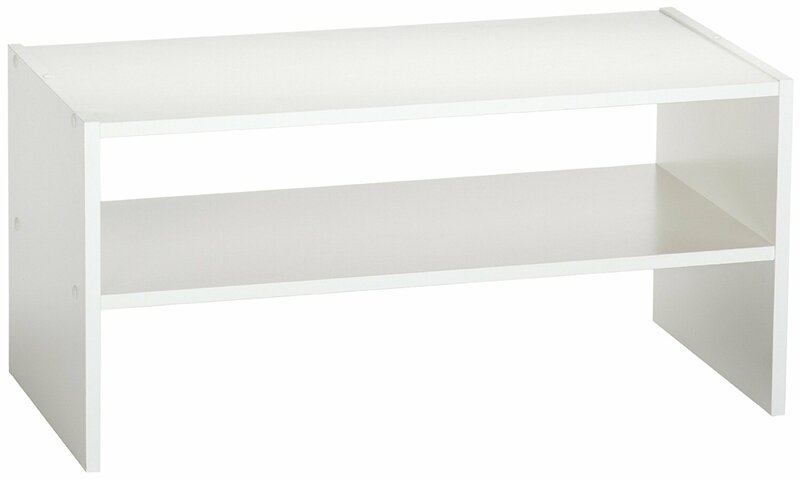 I added a second shoe shelving piece on a shelf in the middle of the closet to better store smaller towels like washcloths and hand towels. Those shoe shelving pieces are actually stackable as well and I use them in many of my cabinets, closets and even under my stove in the kitchen to better stack pots. 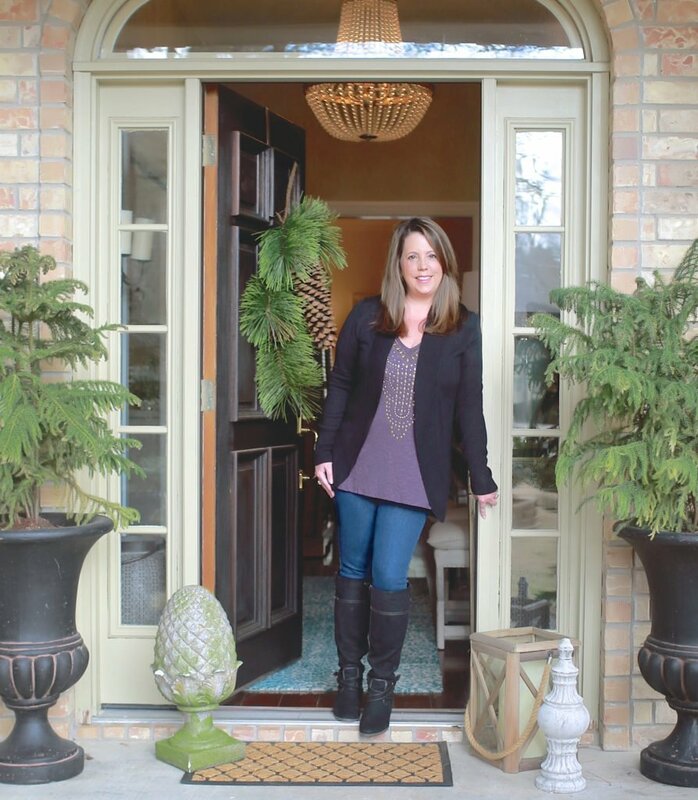 They are a great way to really maximize space! The other thing I did in the closet was to slip in clear storage bins that are traditionally used for organizing pantries and refrigerators. 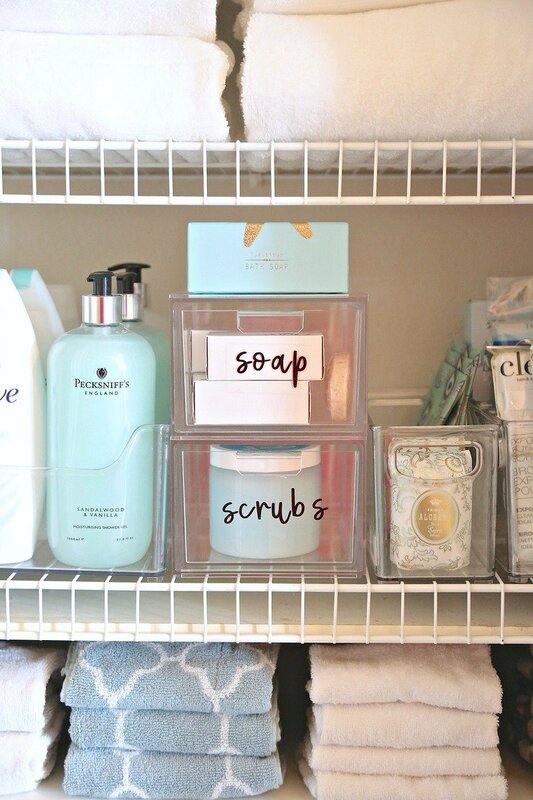 I use these in almost every cabinet and closet in my home because they store so much and you can spot what you need instantly. 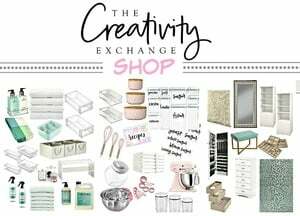 I also added these clear stackable drawers and added our fun free printable labels that you can find here. You’ll also notice in the closet that I organized the items that are less frequently used at the top and the daily used items at hand level. This makes it so much easier to grab and go or put away. 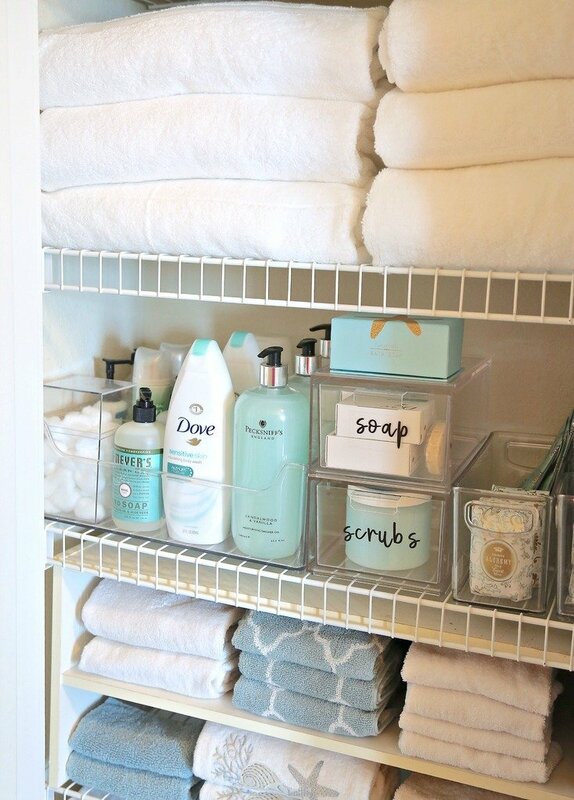 I also love bins in my closets and cabinets and I added in the closet one for storing the toilet paper. I also use fabric bins to toss things like sunscreen, lotions, extra toiletries. 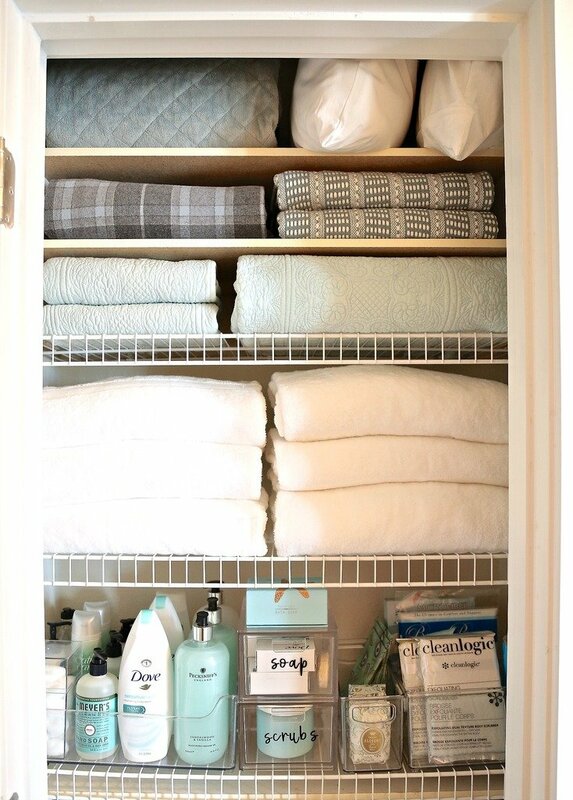 Whether you have a closet or even a cabinet for your linens, these little tricks can help you really maximize every square inch and keep it organized. 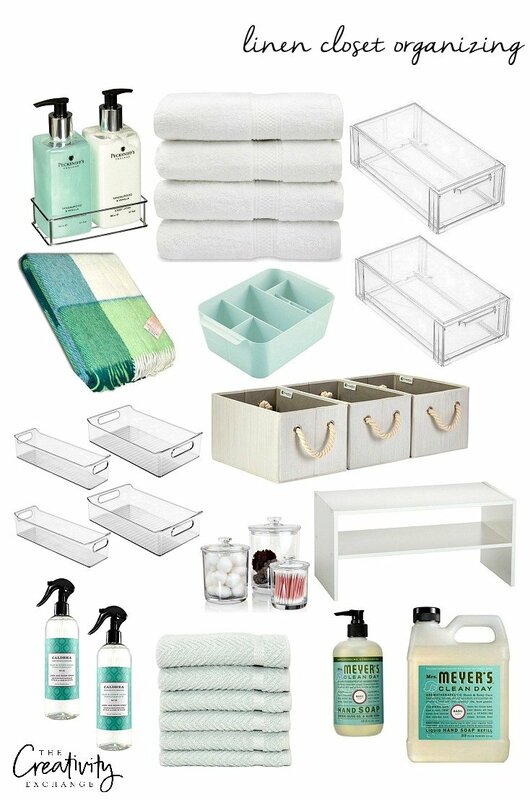 Below are all the pieces I used to organize my linen closet (or similar items) and a few of my favorite products. 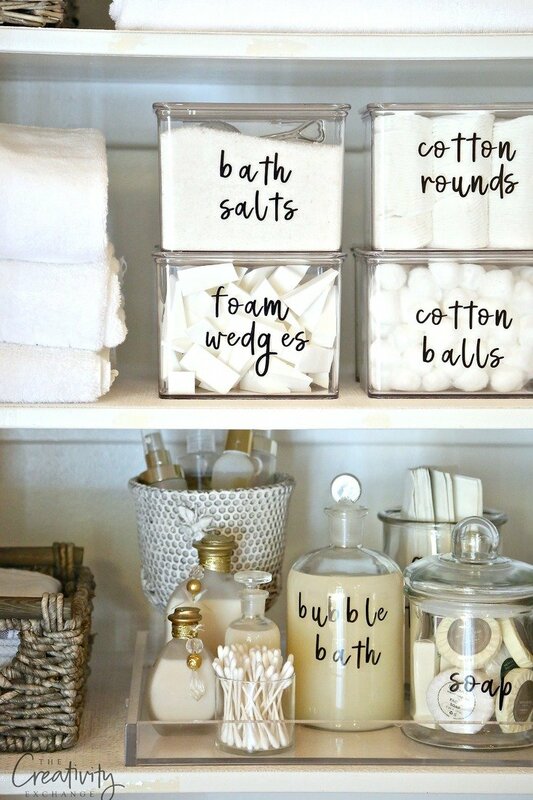 If you’re interested, I have more creative tips for organizing bathroom spaces with the free printable labels that you can edit to help pull everything together. You can get to that post by clicking the image below. What great ideas and thanks so much for sharing. Can’t wait to try some of them. What great ideas. You always amaze me. I love the shoe shelf idea. Will be sure to give it a try. Thanks for sharing. Wow! I see these shoe shelves at Goodwill all the time. Will be snatching them up! Thx! You guys are great! Love your ideas. I also love these ideas. The shoe shelves are excellent , and I never thought about the clear plastic bins for the other things. I can’t wait till its time to declutter in there. I am investing in new towels just became empty nesters and I am decluttering and out with the old and treating ourselves to a few new things . TFS. Loved the organization with the shoe shelf. Bought them but how do you fit them in the closet? Yours appear to just fit with no excess space on the sides. How did you get them in the closet? I took out the wire shelves and still can’t get them to fit.